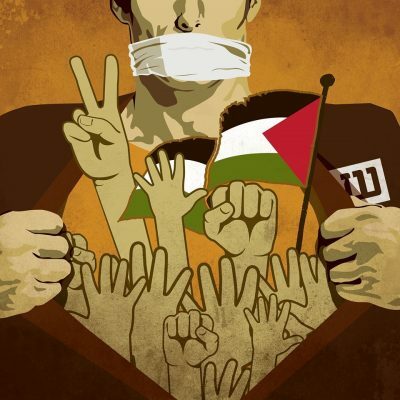 On their 21st day of hunger strike, Palestinian prisoners in Israeli jails are facing an ever more serious health situation, as an increasing number of strikers experience loss of balance, muscle wasting and heavy fatigue, reported the strike’s Media Committee. 1500 Palestinian prisoners launched the strike on 17 April, Palestinian Prisoners’ Day, for a series of demands, including an end to the denial of family visits, the right to pursue higher education, appropriate medical care and treatment and an end to solitary confinement and administrative detention, imprisonment without charge or trial. Strikers have faced sharp repression, including frequent late-night raids by repressive forces, abusive transfers from prison to prison, solitary confinement, denial of legal and family visits and confiscation of personal belongings, sometimes including salt. Hunger strikers rely on consuming only salt and water to preserve their lives during the strike. As the strike has grown and more prominent Palestinian prisoner leaders have joined the strike, repression has also intensified. Some prisoners have been transferred four times since the strike began. Today, the Israeli prison administration reportedly plans to transfer 100 prisoners from Ohli Kedar prison to section 10 in Eshel prison. Meanwhile, 30 of those prominent leaders, including imprisoned Popular Front for the Liberation of Palestine General Secretary Ahmad Sa’adat, fellow PFLP leader Ahed Abu Ghoulmeh, Hamas leader Abbas al-Sayyed, longest-held Palestinian prisoner Nael Barghouthi and imprisoned journalist Mohammed al-Qeeq were transferred on Sunday morning to isolation in Ashkelon prison. All of these transfers also involved barring legal visits for the transferred prisoners. As the health crisis for hunger-striking prisoners looms ever larger, hunger striker William Rimawi was transferred on Sunday morning, 7 May, to the Ramla prison clinic, according to Ma’an News. The prisoners warned of the threat of forced feeding, especially as Israeli far-right Minister of Internal Security Gilad Erdan reportedly threatened to import doctors from other countries to forcibly feed Palestinian hunger strikers in military “field hospitals” set up in Israeli jails. “This trend carries with it preparation for a targeted crime against the prisoners with the intention of murder. It is clear that we are in the next stage now, that of repression, abuse, and attempts to break the strike through threatening the lives of the prisoners. The ongoing preparations indicate that there is a decision taken against the prisoners to their deaths at the hands of a gang of fascists in Tel Aviv. This is what makes this confrontation an extraordinary moment,” wrote the prisoners in their statement. Meanwhile, on Saturday evening, 6 May, the Media Committee of the Prisoners’ Affairs Commission and the Palestinian Prisoners’ Society stated that there were still no serious negotiations from the Israeli prison administration aiming to end the strike. Israeli occupation police in Jerusalem are repeatedly attacking and forbidding events in support of the prisoners organized by their families in the occupied city. Amjad Abu Assab of the Committee of Families of Prisoners of Jerusalem said that the Israeli occupation police declared that they would not allow any event for the prisoners in Sheikh Jarrah neighborhood and threatened to forcibly disperse any assembly. In addition, on Saturday, 6 May, during a gathering outside the International Committee of the Red Cross building, the police surrounded the families of the prisoners and threatened them with attack as they supported the prisoners’ demands. Events throughout Palestine and internationally are continuing in support of the prisoners, especially as the prisoners urged a “week of outrage” to demand implementation of their demands and support for the strikers facing harsh repression. Prominent figures like Palestinian resistance icon Leila Khaled and Catholic patriarch Gregory III Laham have joined students around the world on hunger strike in support of the prisoners; in addition, nine mothers of prisoners and a number of former prisoners are continuing their hunger strikes of support. In Lebanon, four Palestinian youth in Nahr el-Bared camp and six youth from Beddawi refugee camp announced a hunger strike while events and rallies took place on Saturday, 6 May in the refugee camps and in the Khiam former prison in Southern Lebanon, in support of the prisoners’ strike. Internationally, events and actions were organized in Istanbul, London, Birmingham, Whitstable, Norwich, Sheffield, Oxford, Bristol, Glasgow, Edinburgh, Dundee, Inverness, Aberdeen, Uppsala, Dublin, Limerick, Newry, Derry, Berlin, Stuttgart, Cologne, Paris, Auckland and San Diego on Saturday, 6 May in support of the prisoners, while actions are planned on Sunday in Sydney, Amsterdam, Cagliari, Munich, Portland, Fremantle and Quito. Events around the world are available at Samidoun’s global event page.